Did you know that Stampin' Up! 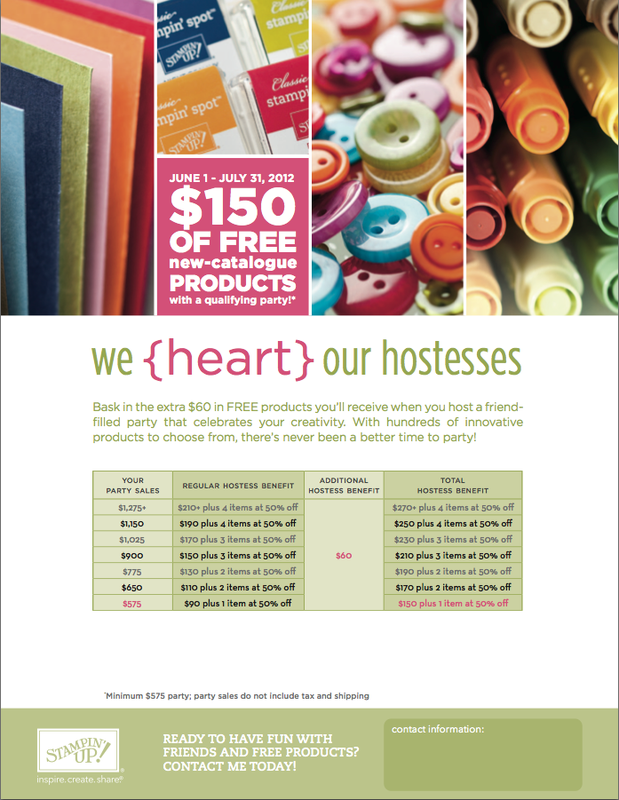 offers Hostesses some great incentives? Our Hostess benefits program is one of the best I've seen and rewards start at only $200 in sales! In Canada, the average Stampin' Up! workshop is $400! That means you not only qualify for Hostess benefits, but you get even more FREE product. But in June and July, the Hostess benefits are getting even BIGGER. When your workshop reaches $525 in sales, you're going to earn even more FREE product! Yep, that's right, I said MORE! When your workshop total hits $525, you're going earn an additional $60 in FREE product. With this great new incentive, my June and July calendar is going to book up fast. Don't miss your chance to get even more FREE product and email or call me, 905-320-4477, today to book your workshop!